The odd branding of sister cities. I remember growing up and learning about sister cities. Seemed like a cool idea and certainly made a kid in small town Ohio feel more connected to the world at large. But, as I now travel around the world on projects, I question the logic of it all. Some cities make a lot of sense. San Francisco and Sydney share a temperate climate, water-side views and a general openness toward life. Milwaukee, WI and Galway, Ireland share an appreciation for beer (or at least that’s the way that it seemed when I visited each). New York City is an easy girl and has befriended several sister cities, Tokyo, Beijing, Cairo, Madrid, Santo Domingo, Budapest, Rome, Jerusalem, Greater London, and Johannesburg. Which only makes me wonder what was wrong with the rest of London? But then of course it starts to break down. Imagine the family reunion between the sister cities of Duluth, Minnesota and Isumi, Japan or Seattle, Washington and Tashkent, Uzbekistan. At some point in time one of those cities is going to realize that they were adopted and they are going to embark on a journey to find their real families. 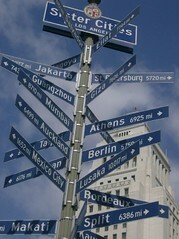 It seems as though the whole concept of sister cities needs a little strategy help. If they are similar, it creates this great small world feel where you realize that there are people in the world who are like you but aren’t near you. If it is about differences, then it is great for kids who need pen pals, although I’m not sure that concept still exists.